Recovering independent mobility, both at home and in the community, is a priority for most stroke survivors. However, information about actual levels of mobility beyond the clinical setting, in the home and community, is lacking. We are using smartphone technology to measure real-world mobility in stroke survivors. Our goal is to determine the effectiveness of rehabilitation strategies, monitor recovery, identify barriers to mobility, inform future interventions to improve mobility, and provide a better understanding of how stroke survivors recover mobility and resume social interaction. Mobile smartphones are essentially highly functional wearable sensors that can be carried unobtrusively while people go about their daily lives. With TEAMM-funding, with our collaborators at the University of Notre Dame, we developed a custom-built application (CIMON) that collects data from smartphone sensors and GPS to quantify mobility and social interactions. The application has a user friendly interface that enables the user to log their physical activities. Data are collected in real time, with no interruption of the individual’s activities, and uploaded into secure servers for analysis. Our mobile phone app and data collection procedures were extensively tested and optimized in able-bodied populations. Currently, 34 stroke survivors are enrolled in the study, have been trained to use CIMON, and are participating in long-term data collection. We are analyzing initial data and developing machine-learning models to identify relevant mobility-related features. This technology may have broad applications in other conditions that impair mobility, such as lower limb amputation. O'Brien MK, Shawen N, Mummidisetty CK, Kaur S, Bo X, Poellabauer C, Kording K, Jayaraman A. Activity recognition for persons with stroke using mobile phone technology: toward improved performance in a home setting. Journal of Medical Internet Research. 2017 May;19(5). Miller C, Poellabauer C. Configurable Integrated Monitoring System for Mobile Devices, Proc. of the 11th International Conference on Mobile Systems and Pervasive Computing (MobiSPC), Niagara Falls, Canada, August 2014. Lonini L. The “Internet Of Things” To Quantify Upper Limb Prosthetic Use: A Novel Outcome Tool. Myoelectric Control Symposium (MEC), Fredericton, New Brunswick, August 18-22, 2014. 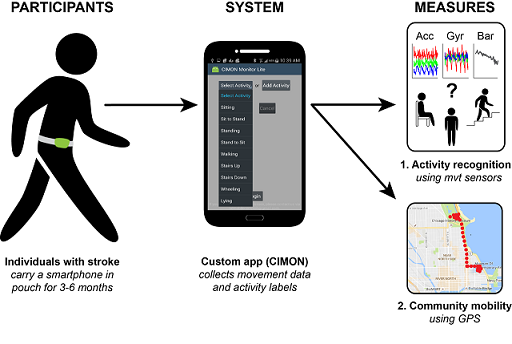 O'Brien MK, Mummidisetty CK, Bo X, Poellabauer C, Jayaraman A. Quantifying community mobility after stroke using mobile phone technology. Proceedings of the 2017 ACM International Joint Conference on Pervasive and Ubiquitous Computing and Proceedings of the 2017 ACM International Symposium on Wearable Computers. Maui, Hawaii, September 11-15, 2017. pp 161-164. Bo X, Huebner A, Poellabauer C, O'Brien MK, Mummidisetty CK, Jayaraman A. Evaluation of Sensing and Processing Parameters for Human Action Recognition. 2017 IEEE International Conference on Healthcare Informatics. 23-26 Aug. 2017 doi: 10.1109/ICHI.2017.56. Bo X, Huebner A, Poellabauer C, O'Brien MK Mummidisetty CK, Jayaraman A. Detecting Label Errors in Crowd-Sourced Smartphone Sensor Data, Social Sense2018, April 17, 2018; Orlando, FL. The contents of this webpage were developed under a grant from the National Institute on Disability, Independent Living, and Rehabilitation Research (NIDILRR grant number 90RE5014-02-00). NIDILRR is a Center within the Administration for Community Living (ACL), Department of Health and Human Services (HHS). The contents of this webpage do not necessarily represent the policy of NIDILRR, ACL, HHS, and you should not assume endorsement by the Federal Government.